Houses, courtyards, palaces, and passageways – that’s how Prague residents see the Lesser Bank. Of the many green oases that lie hidden among the sinuous streets, the palace gardens beneath the Prague Castle are among the most beautiful. The long-dilapidated gardens that were closed to the public began to be opened up gradually during the nineties. Fortunately, their reconstruction brought them as close as possible to their historical state. And no wonder – the conservative Historical Landmark Preservation Institute is principally entrusted with the administration of the gardens. As of today the reconstruction has cost CZK 297 million. The state budget bore the lion’s share of the expenditures, but Britain’s Prince Charles has also contributed to the financing – who, together with Václav Havel, is a patron of the Prague Heritage Fund foundation. 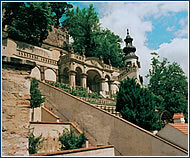 First, in 1995, the Ledeburská and Malá Pálffyovská gardens were opened, after having been off-limits since 1955 due to damaged structure. So now, people who had last walked through the gardens forty years earlier, are finally able to enjoy them again. This happens to be the case with Zbyněk Hyršl, director of Unica, the company that now operates the gardens. 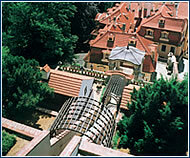 In 1997 the Velká Pálffyovská garden was opened, and the most recent phase of the reconstruction was completed in 2000, with the access to the Kolowratská and Malá Fürstenberská gardens. The first gardens and vineyards beneath the Prague Castle date back to the 14th century, when the southern slope there gradually lost its defensive function. Each garden has developed its own character, bequeathed by history and various owners. The ornate baroque Velká Pálffyovská garden, with its round fountain and cast triton sculpture, neighbors on the east the austere Kolowratská garden, which is planted only with fruit trees and lawns, and on the west the Malá Pálffyovská garden, which is rather utilitarian. This contrasts with the playful, later rococo arrangement of the Malá Fürstenberská garden. 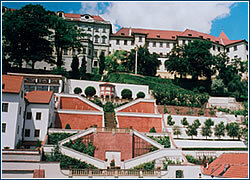 The baroque Ledeburská garden to the west shines on the Lesser Bank with red, axially symmetrical stairways of fired brick, exiting from the terrace above the garden’s parterre. Together with the adjacent, richly stuccoed sala terrena, this serves for organizing concerts. Admission to the gardens costs a considerable CZK 90, CZK 40 for children, students, and pensioners. Hyršl explains this sum: “The gardens must earn the cost of their operation. Furthermore, an admission fee regulates disorderly conduct, because people think more respectfully about entering.” According to Hyršl, there is no graffiti problem in the gardens.